In order to participate in many Community Features, you may be required to register with the Web Site to establish a user profile and obtain or select a username which may be your email address, a screen name which will be used to identify your Content, and/or password. You are responsible for maintaining the confidentiality and/or security of any username, screen name, and/or password(s) you select or are given to use the Community or other features of the Web Site, and you are solely and fully responsible for all activities that occur under your username, screen name, and/or password. You agree to notify Food Lovers Recipes immediately of any unauthorized use of your username, screen name, and/or password(s). Each user is allowed to create one user profile. Automated account creation, participation, and content scraping is strictly prohibited. All Content to the Community and the comments or opinions expressed therein are those of their respective contributors and do not necessarily represent the views of Food Lovers Recipes, its owners, management, or employees. 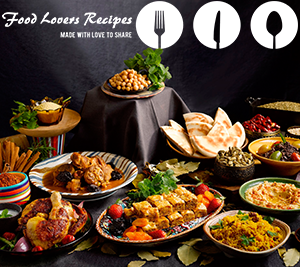 Food Lovers Recipes is not responsible and expressly disclaims all liability for the content of any contribution submitted by users of the Community. Without limiting the foregoing, Food Lovers Recipes will not be held liable for Content that may infringe a third party’s copyright, trademark, or other intellectual property right. The nature of some Content may be offensive, harmful, or inaccurate, and in some cases may be mislabeled or deceptively labeled. You agree that you are fully responsible for any Content that you submit to the Community. Without limiting the foregoing, Food Lovers Recipes reserves the right, but is not obligated, to monitor all submissions and exercise editorial control over all such submissions, including without limitation the right to edit, take down or remove any Content. Food Lovers Recipes is not responsible for any failure to monitor, review, edit and/or delete any Content submitted to the Web Site through any Community Feature. All Content are deemed to be provided on a non-confidential basis. If you make a Contribution to a Community, you understand and agree that we may publish your Contribution in its entirety, as an edited version, or not at all, in our sole discretion. We may remove, alter, or otherwise edit Content that we deem inappropriate for any reason, in our sole discretion. You bear all privacy and other risks associated with using the Community Features of this Site. Accordingly, you should avoid posting personal information such as home address or telephone number. You understand and agree that your username, screen name, and/or full name may be posted along with your Content. To that extent, you do not have the same degree of privacy or confidentiality as you may receive in other areas of the Web Site.